Today I spent the entire day at the Copacabana beach. 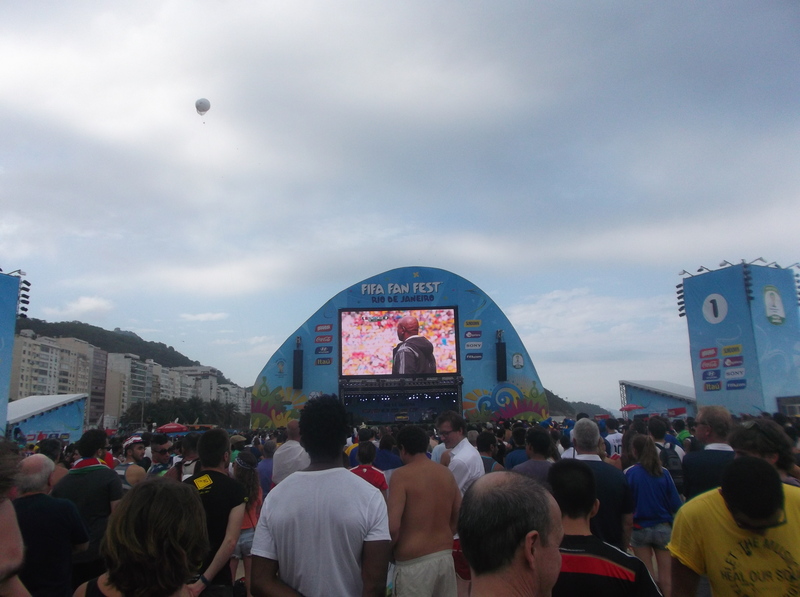 FIFA has organized a ‘Fan Fest’ – basically some viewing areas with large screen TV’s showing all the games, plus they serve refreshments, and there are other attractions like rides you would see at an amusement park, etc.. It’s a beautiful beach, and even though the two teams playing in the early game (France and Nigeria) have no connection to Brazil, there were lots of ‘French’ and ‘Nigerian’ fans who looked suspiciously Brazilian in attendance. Unfortunately the weather was not great as it was cloudy all day, but the atmosphere here is amazing and the people are very friendly. I met up some American fans that were in the city for 1 more day before going to Salvador to watch the US team take on Belgium. Once again, these people were super friendly and we had a few beers and talked soccer for most of the afternoon. After the game, I decided I wanted to get in on one of the pick-up games happening on the beach. Outside the Fan Fest at Copacabana, there are lots of little mini-fields set up with 2 goals, about 15m x 25m in size (ideal for 4v4 or maybe 5v5). People are playing soccer on these pitches literally all day long, and if you want to get in you just have to wait for the right moment and let someone from one of the teams know. I was really expecting to have a lot of fun and thought I might even get to play against a future Brazilian star player. Unfortunately, what I actually saw and participated in was something I have seen and been a part of all too often back home in Toronto, and it will be the topic of my blog today. Somebody needs to explain to me why grown men (and sometimes women) play in a recreational pick-up match as if they are playing in the World Cup final (minus, of course, the skill, fitness, and tactical understanding of the game)?. Instead of 5v5 on the small field, we ended up with something like 10v9, and basically after about 10 minutes the entire game deteriorated into long balls from the goalkeepers looking to find a single striker who was being quadruple-marked, right in front of goal. If the ball ever did manage to spill out from this mess, it was quickly kicked forwards in a completely random fashion, until it eventually ended up right back in the goalkeeper’s hands. Of course, no adult pick-up game would be complete without the customary reckless defending (late tackles, wild sliding, and kicking at balls that were higher than head height). Surprisingly, the worst of the soccer was actually played by the Brazilians, including one who kicked a younger player so hard in the back of the leg that he had to be carried off the pitch by his father. I have to say that I have not played a proper 90-minute soccer game since my last season with York University, which was in 2004 (10 years ago). Since then I competed in adult leagues for a few more years, until around 2008 I decided to stop precisely because of the reckless play I saw today. As a player, I was by no means technically gifted. I did reasonably well at the university level and in the CPSL here in Canada because I was always in good shape and was very aggressive. If anything, I was usually the most aggressive – and even slightly reckless – player on the pitch when I played. But the OUA and CPSL games meant something – there was a reason to be aggressive and to play hard defensively, to risk injuring yourself and someone else as long as you played fairly. In addition, although this environment was by no means ‘professional’, at least there were certain standards for training, fitness, technical ability of the players, etc. There were referees, and athletic therapists present in case players got hurt. It just made sense to play hard, but fair. In contrast, I really fail to see the reason why adults feel the need to be so careless and physical in meaningless games like the one I played in today. Several times when I had the ball, I saw players coming towards me and just got out of the way – there was no way I was going to risk getting hurt in a beach pick-up game after being here for barely 24 hours! I am sure this one game is not representative of all the recreational soccer that goes on in Brazil – if it were, I would have a hard time explaining how the country has produced so many of the worlds most talented players. It was just very surprising to me to see how similar this game looked to the adult men’s leagues that I played in after university, and are so commonplace all over my hometown of Toronto. The answer was interesting. Participants in these studies played truly ‘recreational’ soccer – no scores or standings were kept, and they were not part of a ‘league’ with winners and losers. They simply played small-sided games (usually 7v7 or 8v8), 1 hour per day, 3 days per week. When the researchers conducted other studies using adult league players and compared injury rates between the two, their findings were that the rate of injury in adult competitive soccer was 8x (eight times!) higher than in recreational soccer. Basically, the implication is that as soon as you introduce competition into adult soccer, you are guaranteed to have injuries. This is really not surprising, considering the age, extra body weight, and diminished fitness and skill levels of most of the participants involved in most adult leagues. My opinion is that adults can get all the enjoyment – and physical activity – they need out of recreational soccer without the competitiveness and risk of injuries that go along with the typical adult leagues. In Scandinavia (specifically in Denmark, where the ‘Football for Health’ studies were conducted) there is a big push towards setting up recreational soccer games for adults, supervised by referees, coaches and/or fitness coaches to ensure that people behave themselves. I wonder if/when Canada will look into this option for adult soccer? In any event, it looks like I will be watching France vs. Germany in the Quarter-Finals on July 4th – should be an amazing game!